The village of Milbourne, a little to the NW of Ponteland, is dominated by the Georgian hall of the same name. Built during 1807-09, Milbourne Hall was thrown up by the Bates family to the designs of Edinburgh architect John Paterson and is a standard-looking affair. Constructed of local sandstone collected from the nearby Belsay quarries, its external demeanour belies its curious internal secret: for almost every room within is oval in shape. In a similar vein, the mansion’s stable block is octagonal in its layout. As the house is a private dwelling, we’re unlikely to ever bear witness to these geometrical curiosities, so we’ll have to place our trust in my Pevsner’s guide. © Copyright Phil Thirkell and licensed for reuse under this Creative Commons Licence. As part of the Bates’ development of the general vicinity, a slightly eccentric chapel-of-ease was also constructed in the village in 1869 by Miss Jane Anne Bates. Intended to save her family, the villagers and the staff of Milbourne Hall the long walk into Ponteland every Sunday, the little building of the Holy Saviour has since proved to be quite a success – right through, in fact, to the present-day. 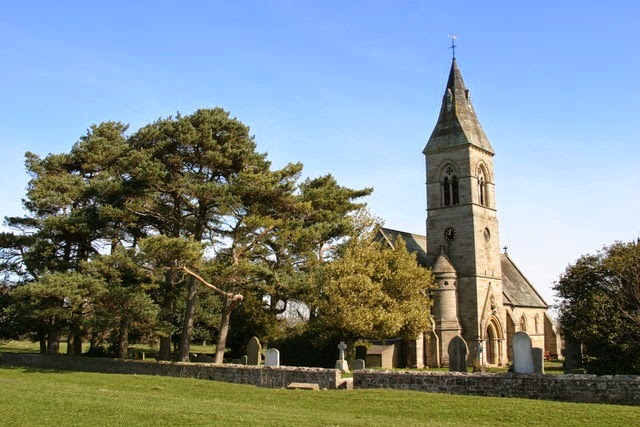 For many religious Pontelanders now make the reverse trip to Milbourne every Sabbath in order to avail themselves of the picturesque facilities in and around the Bates’ Victorian creation. George Hunter, a pitman, has been executed at Morpeth for the murder of another pitman, named Wood, at Dinnington, on December 19 last. The two men had been out shooting together, and on coming out of a public house about dusk Wood began to throw snowballs at Hunter, who thereupon threatened to shoot him, and immediately did it. The jury recommended him to mercy, but the authorities did not interfere. On the day of the murder the prisoner had signed a memorial praying for a pardon for Richard Charlton, who was then under sentence of death for having shot his wife in the same village. The famous ‘Snowball Murder’ of 1875 occurred on a snowy winter’s night as four miners, including the above-named George Hunter and William Wood, were exiting the White Swan pub in Dinnington after a day’s shooting. A couple of the locals were engaged in a friendly snowball fight and Wood decided to partake by hurling missiles at his colleague, Hunter. Not best pleased, Hunter threatened to shoot Wood if he didn’t stop. “Stop heaving and clotting or I’ll fire,” to which the perpetrator replied, “Oh, you’ll not fire, Geordie!” The gunman duly delivered his threat and felled his pal there and then. He fell by the churchyard and soon expired – his funeral the following Sunday attracting 1,500 attendees. George Hunter was found guilty the following spring after it was revealed that he had a history of errant gunmanship. He was hanged at Morpeth on 28th March. Not being best placed in terms of border disputes between the English and the Scots, the town of Ponteland has seen surprisingly little in the way of military action over the centuries. The ‘exception that proves the rule’ was, of course, the town’s complete destruction by the retreating Scots prior to the Battle of Otterburn in 1388. Other than that, though, it’s done pretty well. Perhaps typically, therefore, Ponteland was the site of the battle-that-never-was during the century preceding Otterburn. During the reign of English King Henry III (1216-1272), relations with the Scots were fairly cordial – Henry effectively enjoying overlordship of his counterpart, Alexander II. Things occasionally got a bit frisky, though, one such episode being a fall-out between the two monarchs in the 1240s. The Scots, it seems, were casting their eyes over the northern counties with a view to reclaiming the large tracts of land which they had previously occupied during 1139-57 – all of this fuelled, apparently, by some traitorist muckraking by one Walter Bisset. Whatever the cause of the tension, King Henry decided that a show of strength was required and marched north in the summer of 1244 to Newcastle, and thence to Ponteland, where the action was expected to begin. Alexander was waiting for him there at the head of a large army and everyone held their breath. Instead of fighting, however, “a treaty of peace was concluded between them, on the vigil of the Assumption [sometime in August], chiefly at the instance of the Archbishop of York and of other nobles.” A royal marriage was subsequently arranged, thus ensuring the peace – at least for a while. The ‘Treaty of Ponteland’ is supposed to have been signed at the spot now occupied by The Blackbird Inn, where a fortification of sorts is known to have existed. 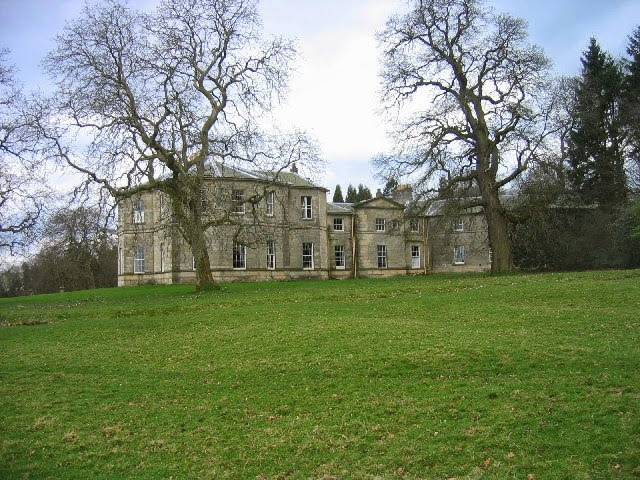 Darras Hall, to the south of Ponteland, is perhaps the most ‘exclusive’ housing estate in the North-East of England. Famed for its plethora of mini-mansions and sprawling gardens, it is best known for being the collective home of many of our most affluent footballers. But how did it all come to be? It will not surprise you to know that the famous Ponteland annex was actually purpose-built, and was always meant to be for well-to-do folk. Until the Edwardian era, the landscape thereabouts was mere farmland, but an enterprising Newcastle-born philanthropist by the name of Joseph Whiteside Wakenshaw thought it’d be a neat idea for the monied classes to have a nice out-of-town village to live in – thus placing themselves a respectable arms-length from the grime of industrial Tyneside. Acknowledging the potential of the growing rail and road network, he looked at his map and brought down his pin on the area occupied (at that time) by Darras Hall Farm and its neighbours at Callerton Moor and Little Callerton. It was relatively poor farmland and Wakenshaw thought he might get it on the cheap, I suppose. Wakenshaw put together a consortium of like-minded businessmen and the purchase was duly made in 1907. The 1,000-acre expanse was divided up into around 190 plots of 5 acres each (which were sold off at auction) and a Trust Deed was drawn up and published in 1910 – a document still in use today and which is enforceable by the current ‘Estates Committee’. Essentially, the document lays down the rules, regulations and guidelines for development on the estate in order to ensure a ‘good quality of life’ for its residents – which basically equates to leaving ‘plenty of space’. Hence Darras Hall’s nickname of ‘The Garden City’. Once an individual had secured a plot there was no obligation for them to build on it (the cheapest went for £35!) – indeed many areas remained undeveloped for decades. However, as land prices crept up, most of the land was given up to residential housing. The place even had its own railway station, but this proved to be a bit of a white elephant and was closed in 1929 (and finally disappeared completely in the 1990s). Strangely, much of the town was given over to a PoW camp during World War II. Despite the restrictive covenants, there has been much development in the designated zone, especially of late. At one time, the ‘new town’ consisted of modest bungalows set in huge gardens, but now small mansions are being carefully placed on the sprawling plots – though there has been a slight easing of the rules and regulations. But all in the best possible taste, of course. Note: Darras Hall was once the site of the medieval village of Callerton Darreynes, abandoned after the Scots destroyed it in the 14th century – and from which the modern-day place-name is just about descernable.